Laser scanning produced a three-dimensional representation of the site. Every time the laser encountered a surface, it recorded a distance as a point. Taken together, the points produce a 3D point cloud, the recording of millions of points that precisely plot the shapes within the site and document the most minuscule details of headstones and monuments in the Rohwer cemetery. In an unexpected union between landscape architects, historians and technology gurus, a small but significant cemetery, which saw its last burial well over 60 years ago, is receiving some long overdue attention. After Japan attacked the United States naval base at Pearl Harbor on Dec. 7, 1941, Japanese-Americans living on the West Coast were victims of racial profiling, because of fear they could be potential spies or conspirators for a Japanese invasion. Though there was no proof that Japanese-Americans were guilty of any attempted sabotage, President Franklin D. Roosevelt signed Executive Order 9066, uprooting more than 120,000 Japanese-Americans – the majority of whom were United States citizens – and forcing them to relocate to 10 different internment camps around the country. Two of these camps, Rohwer and Jerome, were located in Arkansas. Rohwer, a small farming community in the southeastern portion of the state, was the location of the last of all the camps to remain in operation. Opened in September 1942 and closed in November 1945, more than 10,000 internees passed through its grounds, with as many as 8,475 living there during its peak. What used to be 500 acres with 620 buildings divided into 51 blocks is now reduced to a small cemetery and a distant smokestack, all that remains of the camp’s laundry. In the cemetery, only 24 weathered gravestones and four monuments remain to serve as a reminder of this significant story in American history. “May the people of Arkansas keep in beauty and reverence forever this ground where our bodies sleep,” reads one monument in Japanese. Built in 1945 and erected by the internees themselves, this memorial stands to honor the 186 people who died while living at Rohwer. Today, seven decades after the camp was dismantled, three of the state’s universities are teaming up to honor this long ago request. “It’s a nationally significant project we’re blessed to be a part of,” said Kimball Erdman, assistant professor of landscape architecture at the University of Arkansas and head of the effort to survey and document the Rohwer site. Erdman, who has spent his career studying, preserving and planning for culturally significant landscapes, first got involved with Rohwer in spring 2011, seeing it as an opportunity to both explore new technologies and preserve a meaningful piece of history. Kimball Erdman’s landscape architecture class used CAST’s data to produce detailed drawings of monuments. “That’s really what this program is about – raising awareness and protecting what remains of these sites – because frankly very little has been done until now,” he said. Documenting Rohwer is part of a larger conservation effort being led by Johanna Miller Lewis, graduate coordinator for the masters in public history program at the University of Arkansas at Little Rock. Lewis received a National Park Service Grant to restore the Rohwer cemetery, and together with help from the University of Arkansas and Arkansas State University, is working to map, restore and stabilize the site. 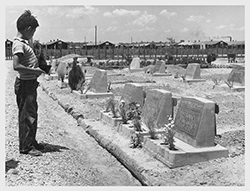 A resident of the Rohwer camp views the grave of a relative buried in the cemetery, June 16, 1944. The University of Arkansas is charged with completing a report for the Historic American Landscapes Survey, which, Lewis said, will be “extremely important to how the architect approaches conservation and stabilization.” To conduct the survey, landscape architecture collaborated with the university’s Center for Advanced Spatial Technologies. Dennis, who holds a bachelor’s in landscape architecture, master’s in geography and doctorate in environmental dynamics, was first approached by Erdman in early fall 2011. Always eager to share and make known CAST’s resources, she, along with Caitlin Stevens, laser scanning specialist for CAST and graduate of the university’s architecture program, began meeting with Erdman to discuss how the center’s technologies could be applied to the Rohwer project. Erdman was set to teach the university’s first historic landscape preservation class in the spring and wanted his students to experience new tools and methods when working on the documentation of Rohwer. “Because of the tools CAST has, I saw it as an opportunity for the students to explore new technologies rather than just using conventional hand tools to document and survey the site,” Erdman said. CAST’s advanced equipment, purchased with funds from two National Science Foundation grants, could promise data that was accurate and of the greatest detail. 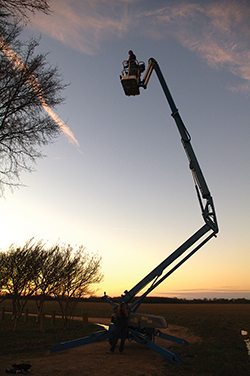 Stevens used the C10 Scan Station to acquire the 3D point cloud. From high up in the lift, CAST technologists collected about 10 scans. After months of planning, the project took off in January 2012. Dennis and Stevens accompanied Erdman and seven students to Rohwer, a five-hour haul from Fayetteville, in a 14-passenger van holding a half million dollars worth of equipment and towing a 50-foot lift behind. The CAST equipment included two types of laser scanners, the high resolution Z+F 5006i scanner and the lower resolution Leica C10 scanner, and two types of GPS units, a survey-grade GPS and mapping-grade GPS. While Erdman and his students moved through the site with the handheld mapping-grade GPS units, Dennis and Stevens set up the survey GPS and laser scanners to take measurements at dozens of locations throughout the cemetery. The goal of the on-site visit, Erdman said, was to get both an overall sense of the character of the cemetery and document the most miniscule details of the headstones and monuments that remain. “When we were mapping where the monuments were, we were mapping not just their location but the names on the gravestones, conditions of the gravestones and dates of death, so that you could actually look at this and create a sort of 3D virtual tour,” something made possible by the laser scanners, Dennis said. The challenge for Erdman and his class now, Stevens said, is to take this point cloud and translate it into two-dimensional drawings as required by the Historic American Landscape Survey and the Library of Congress, where it will be stored. But what of Rohwer’s future? Today, the site appears very different from what it did in its time of operation. Where there used to be sidewalks between close-quarter barracks, surrounded by barbed wire fences and machine gun towers, there is now a lone smokestack and a cemetery of deteriorated headstones in the midst of crepe myrtles and actively plowed farmland. Deciding the appropriate treatment for the future of Rohwer is something both Erdman and the CAST researchers said they would like to be involved in. Though reversing Rohwer to its original state is probably an impractical feat, Dennis and Stevens advocate the creation of a three-dimensional archive, so that the cemetery could be explored online, and all of its data, including names and dates on headstones, could be accessed with a click of a mouse. But plenty of surviving internees would contend that life was not much better inside the barbed wire fence. George Takei, famous for his role as Hikaru Sulu in the original “Star Trek” series, was 5 years old when his family was forced to relocate to the mosquito- and chigger-infested, wooded swamplands of Rohwer, an experience he has called, in interviews, the most “humiliating” and “degrading” of his life. Through his personal social media outlets and various lecture circuits, Takei has remained committed to keeping what happened at Rohwer and the other nine internment camps fresh in the minds of Americans. 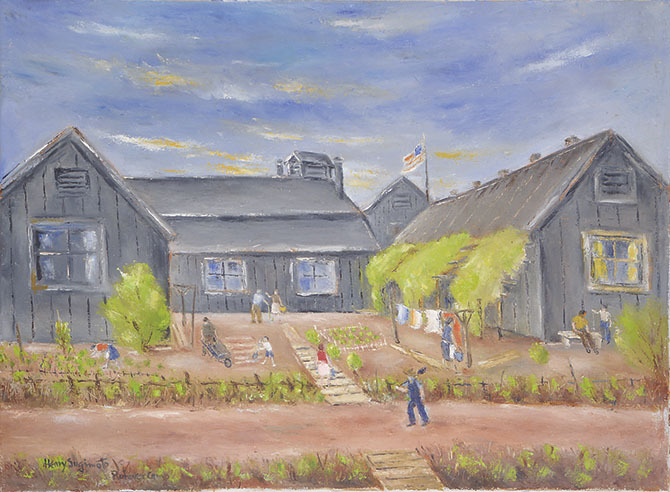 “Rohwer Camp (Thoughts of Loved Ones)” by Japanese artist Henry Sugimoto, who was incarcerated in Jerome and Rohwer. More views of his collection are available on the website of the Japanese American National Museum. Erdman said the experience of mapping the cemetery has been both challenging and rewarding, and he hopes the university will stay involved in Rohwer’s progress for a number of years to come. Stevens said it is also refreshing to see a preservation project that is purely for a landscape. 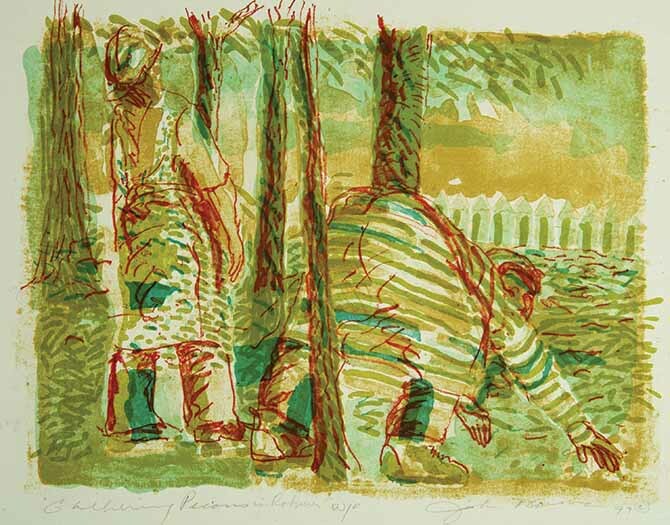 University of Arkansas art professor John Newman has a personal connection to the Japanese internment camp at Rohwer that has informed his series of paintings about the camp and the people outside. His mother’s family was from Rohwer, and he lived there as a very young child. In an article in the fall 2004 issue of Research Frontiers, he recounted some of the stories he’d heard about Rohwer and how African-Americans, who lived under segregation, related to the Japanese-Americans, who lived behind barbed wire. Read the article and see some of Newman’s paintings that grew out of the stories.